The Interactive Credit Card e-Statement offers category-wise tracking of spending through graphical illustrations, which makes it simple for cardholders to quickly assess percentage of spend across various categories such as travel, fuel, dining out and so on. The e-statement also offers cardholders the option to submit requests to convert transactions into flexi plans and offers a tab to dispute transactions with a click. Other options in the e-statement allow cardholders to print in paper statement format, view current card promotions, access quick links to tariff , view card balance transfer , loan on card, flexi plans and CashBack reward summary. Furthermore, the user-friendly e-Statement empowers cardholders to keep up to-date with their card spend to manage finances better and to optimize benefits available on the card. Commenting on this initiative, Lakshman Silva, CEO of DFCC Bank says, “DFCC Bank is constantly seeking ways to add more value to customer experience and the Interactive Credit Card e-Statement was conceptualized in response to customer requests for greater transparency in their Credit Card statements. 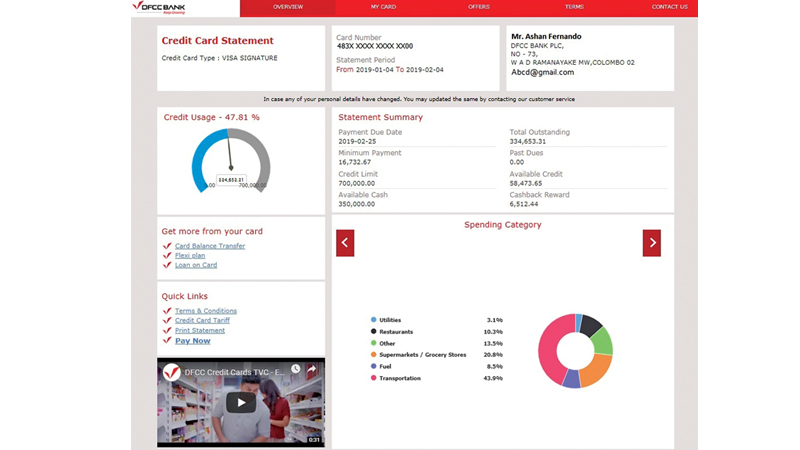 The new e-Statement delivers both an overview and a detailed breakdown of how much and on what the cardholders are spending, so that they can rationalize their expenses better. The transparency that our e-Statement offers truly strengthens the confidence in using the card more freely, secure in the knowledge that cardholders can seek clarification on any aspect of the card via the Interactive feature on the e-Statement. DFCC Bank Credit Cards strive to offer the best value in the market.” Some of the other features of this e-Statement is that it is highly interactive and embeds videos and offers a graphical speedometer illustration of card limit, usage and available balance. Cardholders can view their domestic, international and credit transactions separately. Going a step further, the e-Statement also empowers cardholders to track their spend based on specific merchants locations, while comparing prior three- month spend and previous month’s spend patterns. The e-Statement has an easypassword logic and allows the customer to contact the bank via email, making it much like a personal finance assistant for the cardholder.